Just about anywhere you look around the globe this morning, the picture is the same. Equities are rallying and breaking above intermediate-term resistance levels in the process. 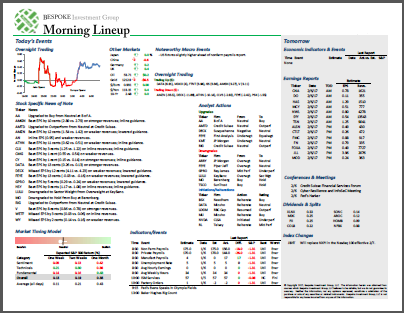 US futures are indicating a higher open this morning on positive sentiment related to the never-ending US-China soap opera, but globally sentiment is improved as economic data showed encouraging improvement/stabilization. One negative economic data point just released, though, was the ADP Private Payrolls report which showed weaker than expected job gains in March (129K vs 175K estimate). So far, there has been little reaction from the market to the report. The perfect way to illustrate the global nature of the rally is through a chart of the Bloomberg World Index. After breaking down below support just under 240 last fall, that level was poised to act as resistance on the way up. 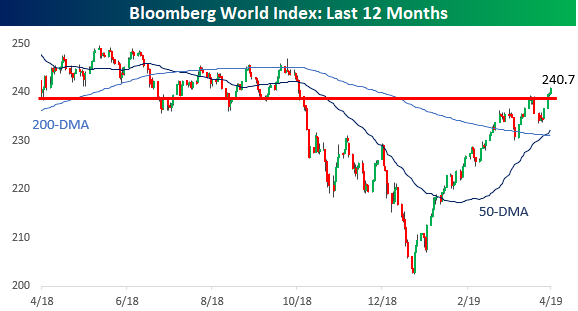 In its first test of that level last week, the Bloomberg World Index pulled back a bit, but it quickly regained its composure and bounced back above that level in this morning’s trade. There’s no arguing the fact that markets are overbought in the short term (a topic we cover in this morning report), but as long as these resistance turned support levels hold, bulls have the momentum.